Watch as your troubling thoughts disappear in a cloud of smoke with this handmade worry hut. You know when those little fears and worries start ping-ponging around your brain? Stephen Zawistowski knows exactly what to do with them: Set them on fire. 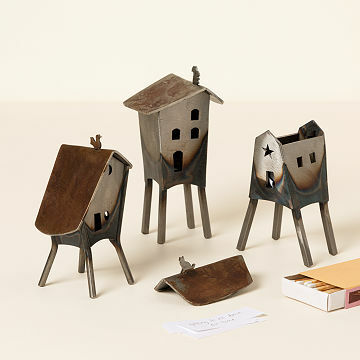 He designed these whimsical worry huts to burn your troubles—a ritual people have practiced for thousands of years. Use the included paper to write down any nagging thoughts, curl them up, and tuck them inside the mini house. Then, carefully put a lit match through the hole in the "floor" until the paper alights (only burn one worry at a time). It's a cathartic activity at the beginning of each week, before a big meeting, or anytime you get the jitters. Send it to a loved one who has a lot on their plate, or a friend who could use cheering up. Handmade in Jacksonville, North Carolina. Steve Zawistowski still remembers the first time he saw an iron worker forge two pieces of steel into one. The sparks, the noise, and the heat all became a symphony of creation. Years later, he saw a welder at a yard sale down the road. He slid on a welding mask and went to work right in his front yard, practicing until he had it down. Since then, Steve has set up shop in his Jacksonville, North Carolina, studio, where he’s assembled a unique collection of new, vintage, and custom-made tools. This collection allows him to work in time-tested, old-fashioned methods, while still incorporating the freedom of creativity allowed by modern sculptural techniques. Includes 50 slips of paper. Delightful Way To Get Rid of Worries!!! I just love the wee house with the cat on the roof. The idea of physically ridding yourself of a nagging worry was a fun concept. When not in use, it makes a lovely conversation piece. A unique gift with a lovely story. The hut comes with little sheets of paper to write your worries on and then place into the hut to burn. The satisfaction of watching those worries go up in smoke is what really makes this little hut worth buying. To add a little extra magic to the whole process I bought some flash paper to write on. The instant flash and ash-less result are also good for indoor worry alleviation.